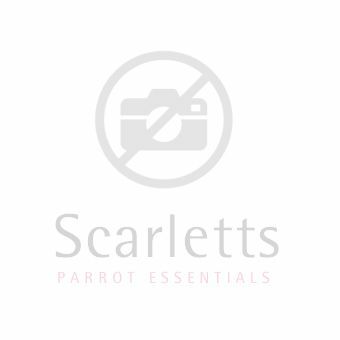 Nutritionally complete pellet diet suitable for large Cockatoos and Macaws. Nutritionally complete pellet diet suitable for mixed collections including large Cockatoos and Macaws. PrettyBird Daily Select Large is a multi-coloured, multi-shaped extruded bird food containing 14% protein and 5% fat. Corn, Wheat, Oat Groats, Corn Gluten Meal, Potato Protein, Soya Oil, Coconut Oil, Calcium Carbonate, Dicalcium Phosphate, L-Lysine, Choline Chloride, Natural and Artificial Flavours, DL Methionine, Isoleucine, L-Threonine, L-Tryptophan, Vitamin E Supplement, Ascorbic Acid (Vitamin C), Ferrous Sulfate, D-Biotin, Yucca Schidigera Extract, Zinc Oxide, Manganous Oxide, Niacinamide, Magnesium Oxide,Vitamin B12 Supplement,BHT (as a preservative), Copper Sulfate, Calcium Iodate, Calcium Pantothenate, Vitamin A Supplement, Sodium Selenite, Folic Acid, Riboflavin, Pyridoxine Hydrochloride, Thiamine Mononitrate, Natural and Artificial Colours, Menadione Dimethylpyrimidinol Bisulfite (source of Vitamin K3), Vitamin D3 Supplement, Cobalt Sulfate. Guaranteed Analysis Crude Protein (min) 14% Crude Fat/Oil (min) 5 % Crude Fiber (max) 4% Moisture (max) 10 % Ash (max) 4 % Vitamin A (min) 17,500 IU/kg Vitamin D3 (min) 800 IU/kg Vitamin E (min) 200 IU/kg Copper (min) 10 mg/kg Storage Instructions Store in a cool dry place. Keep out of direct sunlight.